Minakami Town is located in the north area of Gunma Prefecture. 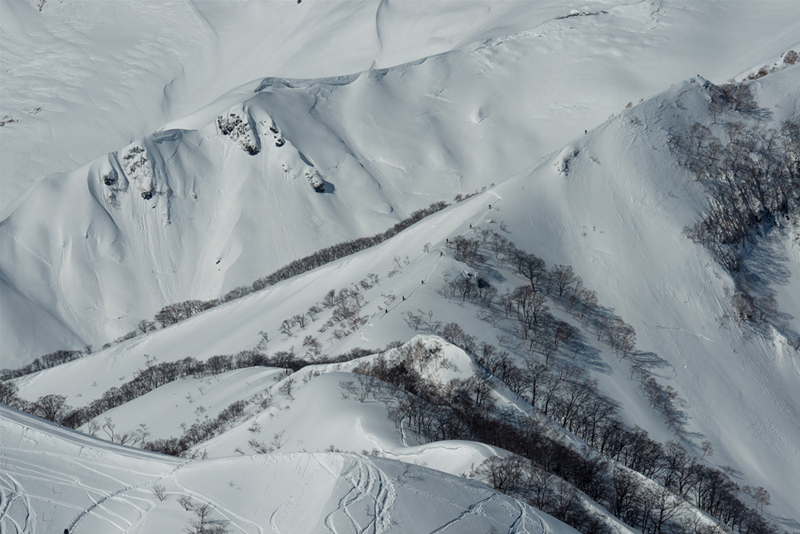 On the border with Niigata Prefecture (and Yuzawa town), the impressive Tanigawa mountain range seperates the two. The area is a popular year-round destination for outdoor sports with rafting in particular popular in the summer months and of course snow in the winter! Onsen hot springs are another reason that many people visit Minakami. From the Nerima Interchange of the Kanetsu Expressway in the north western area of Tokyo, head north until the Minakami IC exit. Most of the ski and snowboard resorts in Minakami Town are accessed by turning left at the Minakami IC exit traffic lights and then turning left again soon after at the Route 291 traffic lights. If you are heading towards Akasawa (or also perhaps Naeba in Yuzawa town, Niigata Prefecture), exit the expressway at the Tsukiyono IC, and follow Route 17 in a northerly direction - signposted as Niigata and Naeba. Akasawa is just over 20km from Tsukiyono IC. Naeba is about 32km from Tsukiyono IC. From Yuzawa and areas further to the north, either take the Kanetsu Expressway to Minakami IC or use Route 17 via Naeba. Although the expressway is a toll road, it is a much more direct and quicker journey. 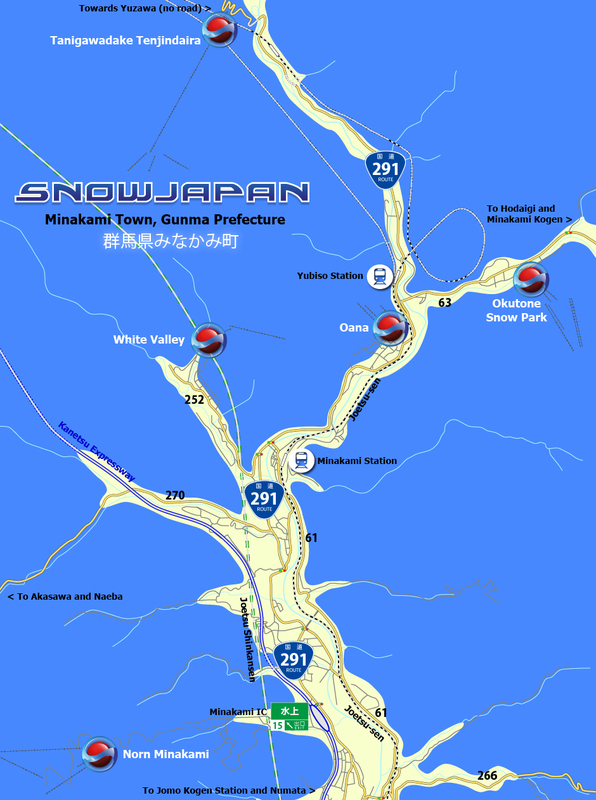 See below for information on how to get to each ski and snowboard resort from Minakami IC. ノルン水上 about 3.5km Turn left onto Route 291 and after just over 100m later turn left. Soon after at the junction, turn right and follow the road up to the base area of Norn Minakami. ホワイトバレー about 7km Turn left onto Route 291, then turn left at the first traffic lights (1.3km) to continue on Route 291 towards Minakami. After 3km take a sharp turn left onto Prefecture Road 252 and follow the signs to White Valley. 大穴 about 7.5km Turn left onto Route 291, then turn left at the first traffic lights (1.3km) to continue on Route 291 for just over 6km to Oana. The small ski hill is on the left hand side, just off the road. 奥利根スノーパーク about 10km Turn left onto Route 291, then turn left at the first traffic lights (1.3km) to continue on Route 291 for about 6km. At the Oana traffic lights turn right onto Prefecture Road 63 (also known as the Okutone-Yukemuri Highway) and follow the signs to Okutone, less than 3km. The resort is on the right hand side of the road. 谷川岳天神平 about 13.5km Turn left onto Route 291, then turn left at the first traffic lights (1.3km) to continue on Route 291. At the Oana traffic lights continue straight on to head up to Tanigawadake Ropeway. 水上宝台樹 about 19km Turn left onto Route 291, then turn left at the first traffic lights (1.3km) to continue on Route 291 for about 6km. At the Oana traffic lights turn right onto Prefecture Road 63 (also known as the Okutone-Yukemuri Highway). 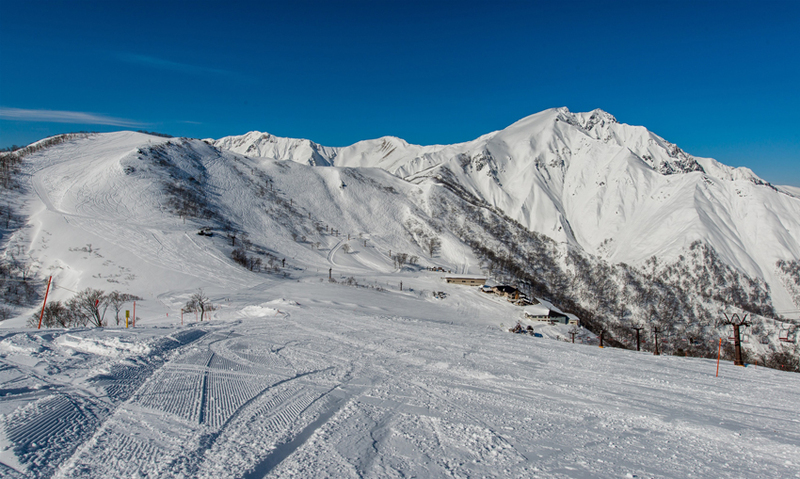 Go past Okutone Snow Park on the right and soon after you will arrive at some traffic lights. Either turn left (if you are equipped for and used to using winter snowy roads) or continue straight on for around a further 9km to the signposted turn off towards Hodaigi. 水上高原藤原 about 20k Turn left onto Route 291, then turn left at the first traffic lights (1.3km) to continue on Route 291 for about 6km. At the Oana traffic lights turn right onto Prefecture Road 63 (also known as the Okutone-Yukemuri Highway). Go past Okutone Snow Park on the right and soon after you will arrive at some traffic lights. Either turn left (if you are equipped and used to winter snow roads) or continue straight on, past the turn off and signposts for Hodaigi and further on until you see signposts for Fujiwara. 水上高原スキーリゾート about 21.5km Turn left onto Route 291, then turn left at the first traffic lights (1.3km) to continue on Route 291 for about 6km. At the Oana traffic lights turn right onto Prefecture Road 63 (also known as the Okutone-Yukemuri Highway). Go past Okutone Snow Park on the right and soon after there are some traffic lights. Either turn left (if equipped and used to winter snow roads) or go continue straight on, past the turn off and signposts for Hodaigi and further on until reaching signposts for Minakami Kogen. Turn onto Route 17 from the exit of the Tsukiyono IC of the Kanetsu Expressway to head north towards Naeba. After about 17km you will see signs for Akasawa on the left side - turn left here. Turn onto Route 17 from the exit of the Tsukiyono IC of the Kanetsu Expressway to head north towards Naeba. 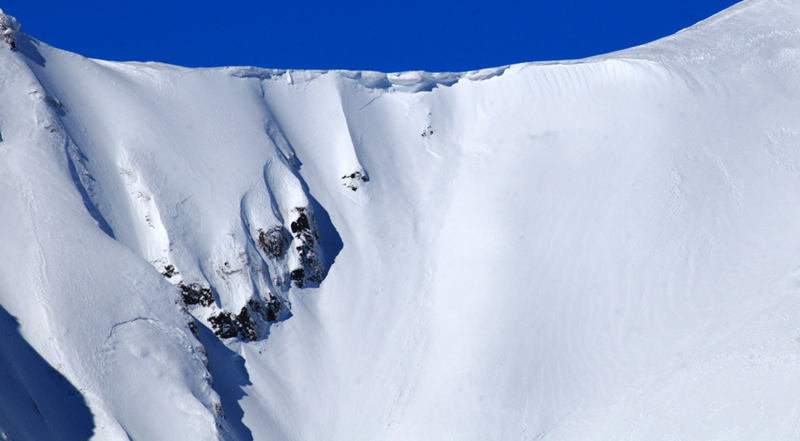 Follow Route 17 into Niigata and to the Naeba resort. Take the Kanetsu Expressway north from Minakami IC to Yuzawa IC. From the Yuzawa IC exit turn left or right to the resorts in the region. Take the Kanetsu Expressway 17km south from Minamaki IC to Numata IC and then turn left onto Route 120 (known as the Nihon Romantic Highway). Turn left at the second set of traffic lights after about 400m to head towards Kawaba on Prefecture Road 64. After about 7km turn left onto Prefecture Road 263 and follow the road and signs up to Kawaba. 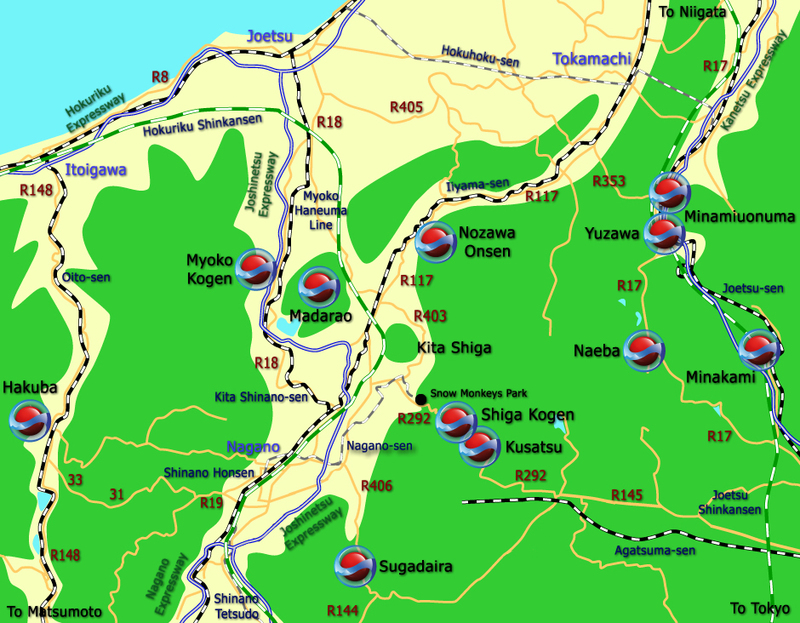 Take the Kanetsu Expressway 17km south from Minamaki IC to Numata IC and then turn left onto Route 120 (known as the Nihon Romantic Highway), through Numata towards Nikko for about 25km into central Katashina Village. On the other side of central Katashina, turn left onto Route 401 to head towards Katashina Kogen (4.5km), White World Oze Iwakura (6km) and Snow Park Oze Tokura (10km). Keep going straight on Route 120 to get to Marunuma Kogen (13km). Take the Kanetsu Expressway about 12km south from Minakami IC to the Tsukiyono IC. Follow the exit road round onto Route 17 heading towards Naeba in a westerly direction for around 1.5km. Turn left onto Prefecture Road 36 and continue for about 8km until reaching Route 145. Turn right, go through Nakanojo and follow Route 145 and then Route 292 up to Kusatsu. Take the Kanetsu Expressway north from Minakami IC to Shiozawa Ishiuchi IC. At the exit turn right onto Prefecture Road 28 and head towards Route 17. At the Route 17 traffic lights, turn left heading towards Yuzawa. After 650m there is a sign for the Nozawa Onsen turn off (Route 353). Turn right and continue on Route 353 for about 18km until reaching Route 117. Turn left onto Route 117 towards Nagano for about 31.5km, passing through Tsunan Town and Sakae Village until reaching the turn off for Nozawa Onsen. The village and ski resort are about 4km off Route 117. The resort car parks are clearly signposted on approaching the village. For detailed information on how to get to Minakami by train and public transport, please go to this section.